Three weeks ago the Phillies wrapped up Alumni Weekend with a 7-6 Sunday win over the Rockies. The offense didn’t put that many runs on the scoreboard again until yesterday, a 6-2 win in Miami. During that three week period, the Phillies hit 17 home runs. Guess who shares the lead with four each. None other than the Venezuela double-play buddies, Cesar Hernandez and Freddy Galvis. Galvis’ fourth was an upper deck blast to right field yesterday. Jerad Eickhoff survived having the first two batters scoring but battled through five scoreless innings. He retired 11 of the last 12 hitters. A bulldog on the mound Eickhoff kept his team in the game paving the way for the come-from-behind win. He isn’t flashy and overpowering but grinds his way through every inning. Edubray Ramos, Hector Neris and Jeanmar Gomez did their thing, one perfect inning apiece. Eickhoff was 2-8 after a June 2 loss. He joined Jeremy Hellickson in double-figure wins. Last time the Phillies had two pitchers in that scenario was 2013, Cliff Lee (14-8) and Kyle Kendrick (10-13) . . . Galvis’ homer in the fifth broke a streak of 18 scoreless innings . . . His previous four homers came in loses . . . Ryan Howard has 103 plate appearances and no home runs in Marlins Park. Lehigh Valley IronPigs (84-58), International League North Division. Wildcard winner. Ended the season with a 7-0 win over Rochester. WP: David Buchanan (10-9), 7-2-0-0-0-8. Luis Garcia pitched a scoreless ninth extending his scoreless streak to 17.1 innings. 5 different players had multiple hits led by 2B Jesmuel Valentin’s 3. 3B Taylor Featherston (3) and 1B Brock Stassi (2) were the RBI leaders. Day off today is followed by the start of the semi-final playoffs against the Scranton/Wilkes-Barre Railriders (NYY). Reading Fightin’ Phils (88-52), Eastern League Eastern Division Champions. It was only fitting in Trenton’s Arm & Hammer Park the Fightins put on a power display in a 5-run 10th inning and an 11-6 season finale win. 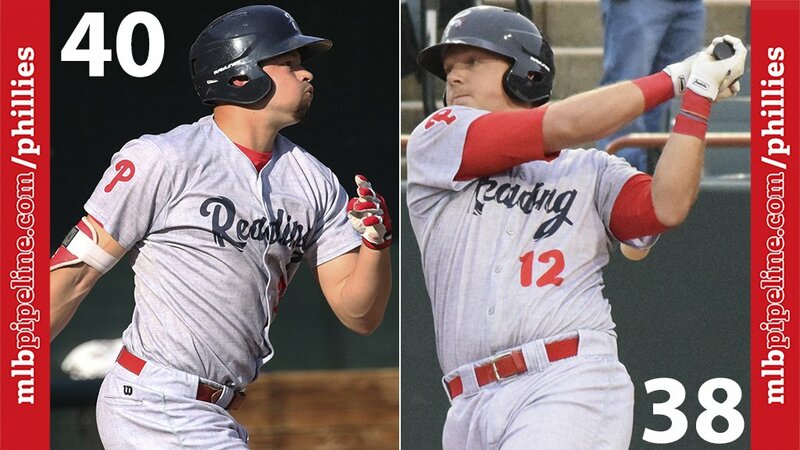 RF Dylan Cozens led off the explosion with his 40th home run and fellow slugger, 1B Rhys Hoskins, followed with his 38th blast. 2 batters later 3B Harold Martinez unloaded a 2-run HR (9). CF Roman Quinn wrapped up the inning with a run-scoring 2B. He had 2 doubles, a single, 2 RBI and 2 SB (30-31). Victor Arano, one of 6 Reading pitchers, worked out of a bases-loaded jam in the B9 and was the winner (1-1). Cozens is the first Eastern League player with 40 home runs since Glens Falls’ Ron Kittle in 1981. He finished with 125 RBI in 134 games and set Reading records in homers, RBI and total bases (304). He also led the minor leagues in homers and RBI. Reading and the Trenton Thunder (NYY) closed out the season with four games in Arm & Hammer Park. Following a day off today the two teams return there for the first two games of the Division Series. Lakewood BlueClaws (44-25), South Atlantic League North Division. 2nd-half champions. Ended the season by sweeping a four-game series against Greensboro, 5-0. It was the BlueClaws’ 3rd straight shutout and improved their September record to 5-0, giving them 30 wins in their last 40 games. WP: Harold Arauz (6-6), 7-4-0-0-1-8. DH Jan Hernandez, 2 H, RBI. 1B Will Garcia, 1 H, 2 RBI. CF Mark Laird, 1-3, to finish the season at .353 in 31 games in Lakeland. Day off today is followed by the start of the playoffs on Wednesday against the 1st-half winners, Hagerstown Suns (WSH). Williamsport Crosscutters (39-36), New York-Penn League Pinckney Division. Ended their season with a 4-2 to division champion State College. CF Dave Martinelli, 1B, 2B, RBI. SS Chandler Hall, 3-4. Gulf Coast League Phillies, (43-15), Northwest Division Champions. Blanked by the Cardinals, 3-0, in the opening playoff game in Jupiter. Phillies out-hit the Cardinals, 7-4, but left 11 on base after going 0-8 with RISP. LP: Mauricio Llovera, 4.1-3-3-3-3-4. Game 1, Cardinals 4, Phillies 0. Game 2, 12 noon Tuesday, Clearwater. Lehigh Valley: OF Osmel Aguila, transferred from Reading. Reading: CF Roman Quinn, activated from DL; RHP Will Morris and LHP Elniery Garcia, transferred from Clearwater. GCL Phillies: INF Raul Rivas, transferred from Clearwater. 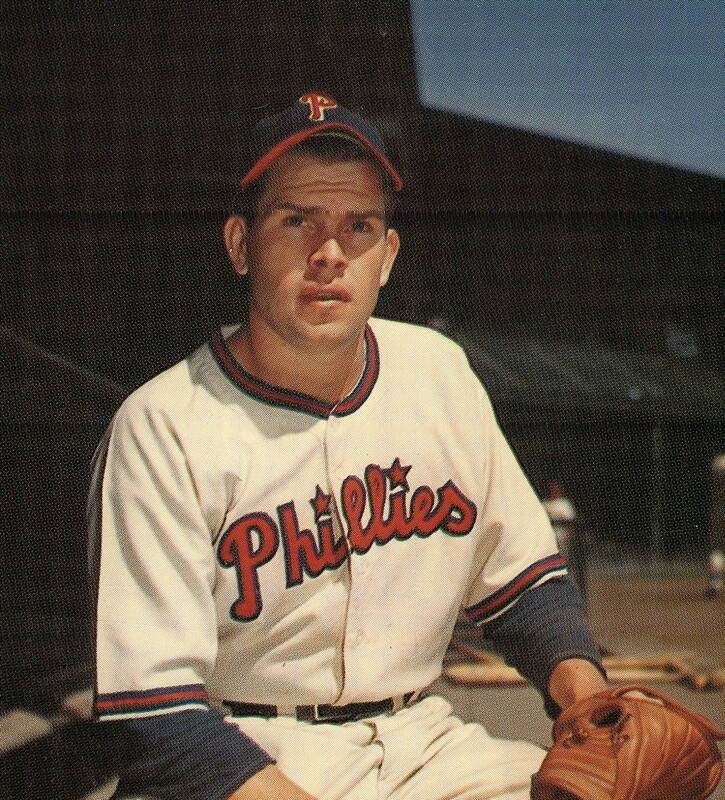 RHP Robin Roberts gives up six runs in eight innings but goes the route as the Phillies rally for a 7-6 win over Boston in 17 innings, first game of a Saturday doubleheader. Roberts’ line: 17 innings, 18 hits, 6 runs, 5 earned, 2 walks, 5 strikeouts. He faced 71 batters. Assuming he threw five pitches per batter, that’s 355 pitches. Second game is suspended after eight with the Phillies losing. It is completed the next day, a 3-1 loss. (Phillies Insider will be posted seven days a week until the minor league playoffs end. Happy reading).